Now that it's November 2, we all know how close we are to the holidays. And while I've started on gift lists and just a wee bit of online shopping, my most enjoyable thing to think about is baking! I love baking. And I've decided that this year will be the year of biscotti. While I generally make biscotti every year, this year I think it's going to be the only thing I make in terms of baked gifts. In the past, I've done a mix of quick breads (cranberry, pumpkin, and eggnog) and biscotti as gifts. But the problem with the quick breads is that if you want to make them ahead of time and then freeze them, they can sometimes get a little soggy when they come out. Not terribly so but I don't always like the result. Anyway, biscotti can be made even further in advance and freezes beautifully as long as you don't do any chocolate coating. Plus, I've got like 4 new recipes I'm dying to try that are a little less common. Coconut Lime, Pumpkin Pie, Butter Brickle, and Chai-Chocolate. 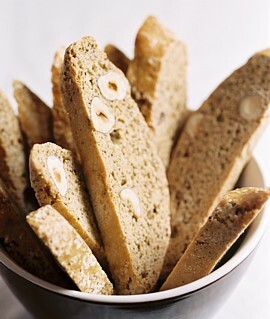 I'd also LOVE to find an eggnog biscotti recipe, but I haven't found one. That's not completely true, I did find a few but none of them have a drop of eggnog in them and the reviews haven't been great. After making the eggnog quick bread, I want a biscotti recipe that tastes like that bread. I'm a little afraid of making up my own though based on the fact that it involves adding liquid to a cookie dough that could totally throw everything off. I will probably make one or two of my old standby recipes that are really good too. So my goal is at least 6 different kinds of biscotti and perhaps doubling a few of the recipes. So if anyone happens upon an eggnog biscotti recipe, please forward it onto me. Maybe if you make the glaze you could use eggnog in place of the milk? Just a suggestion. Can you send me the chai chocolate recipe? Chai is my "new" thing...ha.